Local Website Archive Lite (free) is a useful program for collecting Web pages you might wish to reference again, especially those with information you're likely to need offline. It's not a spider or site-duplication tool; it's designed to save individual pages. Although it's usually possible to do this from within a browser, it can be awkward to do so; I often end up with forgotten .html files scattered in odd directories. Local Website Archive maintains its own internal structure of folders, so it's easy to find your pages again. Local Website Archive Lite lets you add notes to archived pages, which can help remind you why you archived them in the first place. For the most part, Local Website Archive Lite is intuitive and easy to use. You can create an archive with any name, i.e, "My Web Pages" or "Project Files", and then you simply start adding in pages. You can do this in several ways: You can open a page in a browser, then go to Local Website Archive and click "add" (it will know the pages you have opened), or, more usefully, you can add extensions to browsers such as Explorer or Firefox to place this functionality in a context menu. Right-click on a page, choose "Add to Local Website Archive," and, there you go. You can create multiple archives; you might want one for work and one for personal use, for example, each one subdivided into folders. I've only got a few issues, mostly about the interface. There are a number of oddities. For example, when saving a page, you cannot create a new archive folder on the fly, and you can't see a list of all your existing folders in a drop-down; you have to push a button to select a folder, and the folder must have already been created. It's not possible to save just part of a page--when going through a webcomic, for example, I often wish to save just the comic image and not the surrounding page. To get around this, I'd have to buy the paid version and edit the saved HTML. However, these are relatively minor quibbles that don't interfere with Local Website Archive's functionality. 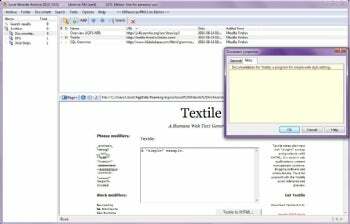 Local Website Archive Lite is free for personal use. There is a pro version which includes more advanced import, export, and editing functionality. Vendor Aignesberger Software GmbH provides a feature comparison at their Web site. Unlike many "lite" or "free" versions, Local Website Archive actually offers considerable functionality as-is and is not simply a "teaser" for a paid version.